Eastern-most crossing of the Missouri River. About 10 miles from the bike stop cafe to the Golden Eagle ferry, mostly on paved greenway trails. No facilities open along the way in the winter. Is there a place to park a car at the Kirkwood Amtrak station for a week instead of using a shuttle from St Charles? There is an outdoors shop called the Alpine Shop about 4 blocks away. They have plenty of parking and you could walk to the station. nice place for last minute purchases as well. There is long term pay parking at the Kirkwood station. Just remember to allow plenty of time to park and pre-pay at the entrance of the lot. The lot is actually on the other side of the tracks near Bar Louie so you want to allow plenty of time to get back to the station before the train gets there. Otherwise you will be stuck :( My dad and I road Clinton to St. Charles in June. This is where I parked for the week. No problems at all. Again, allow PLENTY of time. August 2018 - Just finished riding Katy from Machens to Boonville on a fully loaded tandem with extra wheel trailer without issue other than a mystery flat tire. The picnic pavilion at Frontier Park has electrical outlets to charge devices. Closest mailbox to drop off postcards to the folks back home is at the corner of Main and Jefferson Streets beside Llywelyn's Pub. If you need a grocery store, we used Midtowne Market after staying with a local host not too far off the trail and found everything we needed. I stayed at the Country Inn & Suites 5/29/2018. The hotel is right on the trail (but I didn't see a sign so I bypassed it initially). Washer/Dryer on every floor and a great breakfast. I would stay here again. Highly Recommend!! Yes, this was hard to spot. Name was on the side in the direction we weren't coming from. lol My trike fit in the room on the 1st floor. It was great that they have double wide automatic doors at the entrance. Yeah! Cookies were baking. I think my trike would have fit in the elevator, but the clerk was so nice and let me have a 1st floor room. Walked to historic downtown (.2 miles about), food was great there. Rode the KT end-to-end May13-16 and had a great trip. 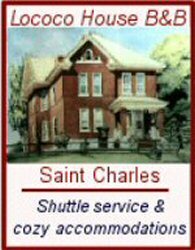 Actually started in Warrensburg on May 12 and traveled via Amtrak to Kirkwood Station, where the folks from the Frenchtown Inn met me and transported me to St Charles. 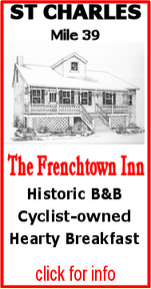 Other comments concerning the Frenchtown Inn are spot on and it's a great place to stay. I did go out to Machens and back the first afternoon for a shakedown ride, and while it is pretty spare, an interesting detour is to Portage des Sioux, only a couple miles more. I found the entire trail in great shape, although there were two thunderstorms in four days with warm temperatures in between. Be aware the only station with water between St Charles and McKittick is at Dutzow, although the small towns along the routes have water and cold drinks for purchase. How did you get back to Warrensburg from the trail? I am fortunate in that I have relatives in the Warrensburg area and thus when I arrived in Clinton I had family there. Now, if I did not have family nearby, I would have contacted one of the shuttles in the area and arranged local transportation. (I had originally planned to do this as I thought the folks would be away). People I'd met in Pilot Grove when I rode the KT last year had started from Clinton and were planning to ride the train back to Warrensburg from Jefferson City (where they stayed on their second day), as they had left their auto in Clinton. They had pre-arranged their post-trip transportation in Clinton. Note that Clinton has lots of pretty nice lodging, restaurants, etc., as does Warrensburg, and many have accommodated cyclists. I think it's worth it to arrange shuttles, even though I realize it's an additional expense, because 13 Highway between Clinton and Warrensburg is a route I wouldn't ride, and I'm used to riding on streets and roads with vehicles all around. One last tidbit: It is possible to get to Warrensburg from Clinton via the side roads, most of which are not heavily used (watch for horse and buggy). It can be a jigsaw puzzle though. Hope I haven't been too wordy, but the trail is worth planning for. I rode the Eastern half of the Katy Trl (Jefferson City to St. Charles and back),from May 5th-11th. As far as water goes, bring your own. Stores were all closed when we rode through. Dutzow water fountain was off. I did manage to buy 2 water bottles from a vending machine in one small city. The Western half of the trail has many more trailheads that provide water. So, in that regard was much better. More hilly than the East half. Saw a post that the Machens end was shut down due to flooding about 5 miles out from St.Charles, so didn't make it that far. I should have clarified my comment about water at the Dutzow station. The outside fountain was in fact not working, but the sink in the restroom was fine. The bike shop in Defiance had plenty of cold drinks, and that's where I'd stopped. Just my two cents, but three 20 oz wattle bottles (or maybe 2 quarts (64 oz)) per person is plenty of water for a 60-mile run such as that between St Charles and McKittrick. St Charles is one of my favorite places to visit. We rode the Katy Trail from Pleasant Hill (Rock Island Spur) to Machens. St. Charles was basically the culmination of this ride. We rode this day from Augusta. There is basically a food dessert from Augusta to St. Charles. We stopped at the Bike Stop Cafe for lunch. This was the second time we had eaten at the cafe. Previously we had an excellent breakfast, this time we had an excellent lunch. It was delicious and hit the spot. We rode on to Machens and the "end of the line". We were met at Machens by Larry of the Frenchtown Inn. Larry loaded our bikes up and took us to the Inn. Chris met us with cute Halloween cookies and a "beer on the house". The Frenchtown Inn is a perfect B and B. It is well decorated, well stocked, and very very comfortable. The bathroom had all the niceties and fantastic towels and bath robes. The room was spacious and included a couch. Breakfast was amazing. Chris and Larry visited with us while we had our beers and they were excellent hosts; friendly but not intrusive. We went to dinner at Bella Vino in St. Charles, an outstnading Wine and Tappas bar. Again, this was not our first visit but we still loved it. After our wonderful night's sleep and breakfast, Larry loaded our bikes onto his vehicle and gave us a ride to the Kirkwood Amtrak station where we boarded Amtrak with our bikes and headed home to Lees Summit. We are looking forward to our next trip to the Frenchtown Inn and a visit with Chris and Larry. The address is actually 903 S. Main St. I used to live above the restaurant and I have nothing but good things to say about this place. It's easily the best place to eat on Main St. The patio is ideal for either a quick lunch or sitting back for some cocktails. It's nestled in lush landscape, and the staff is on the ball. I love Magpie's and would weigh a lot more if I still lived above it. Planning to start a ride tomorrow at Black Walnut. Anyone know of any current trail issues between Black Walnut and St. Charles? You might want to reconsider starting there. Between Black Walnut and St. Charles there is a section of the trail closed around mile marker 35 in June. I was able to walk through it in June; however, it's rained a lot since then. You could use the levee that bypasses the problem area; however, I nearly crashed using it as there are some deep ruts that you can't see. I'd recommend walking it also unless you are on a fat tire mountain bike. Plus that section of the levee might be private property. Thanks Jerry. I will replan my route! Site indicates no adverse trail conditions within 20 miles but the trial is closed due to flood damage at MM035. It may be passable, but not fun to ride. you can easily walk around the closed barrier at mile 35. after that there is a tree that blocks the trail, but again an easy walk around. there is about a 100 ft section of trail that is now loose sand, i walked it. lastly, there are some washouts on the trail which can be biked around. of course, these obstacles would be much worse if the trail was wet / saturated...but really not a problem when the trail is dry. there is a large tree fall blocking the trail just before black walknut...bike must be lifted over that, but not that difficult. LOCOCO House was our choice for the last nite on a thru ride, very nice place , the people were very nice,after we put bikes away they gave us a ride back down to Main street, so we could get supper. Breakfast was a little later than we liked but worth the wait. Does anyone know if it is illegal to ride across the 370 Bridge since it isn't marked with bike lanes anymore? My second question is when are they going to re-stripe the bridge to put the bike lanes back. Here is the statement MoDOT has on their site. Route 370 Temporary Bike Lane Closure. MoDOT closed the bike lane on the Route 370 Missouri River bridge in November 2011. The Route 370 bridge is restriped to add a fourth lane on 370 between Earth City Expressway and Route 94. The extra lane will help traffic during the closure of the westbound I-70 bridge. The fourth lane on Route 370 will be removed in 2014 and the bike lane will be restriped by mid summer 2014. During the closure, cyclists should use Route 364 Page Avenue to cross the Missouri River. Here's the link with the detour map. I read that but what I want to know is if it is illegal to cross the bridge. I am planning on doing an end to end ride in late June ending in Machens and I live in North County so it will add about 15-20 miles to go all the way down to the page avenue bridge. It would be much easier if I could just cross the 370 bridge. There is still a shoulder on the bridge so it shouldn't be to dangerous to cross there if traffic isn't to bad. Thanks for the input. 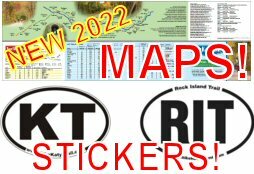 370 is listed on the 2013-2014 Bike Path Map on MODOT's website. Probably not illegal. If you are really concerned, contact MODOT or the Highway Patrol. Not sure but, I always thought that bikes could travel on all MO highways unless they were specifically marked as forbidden. 307.191. Shoulder Riding, Allowed But Not Required For Bicyclist Operators (1) A person operating a bicycle at less than the posted speed or slower than the flow of traffic upon a street or highway may operate as described in section 307.190, or may operate on the shoulder adjacent to the roadway. (2) A bicycle operated on a roadway, or the shoulder adjacent to a roadway, shall be operated in the same direction as vehicles are required to be driven upon the roadway. (3) For purposes of this section and section 307.190, “roadway,” means that portion of a street or highway ordinarily used for vehicular travel, exclusive of the berm or shoulder. My understanding is the only time you can't ride in a traffic lane is when you couldn't ride at the minimum speed posted such as an interstate highway. Even then its legal to ride on the shoulder. Possibly not illegal, but definitely suicidal. 65mph traffic with no shoulder? don't do that. Where do I start? Why do I bother? MO-370 is not an interstate. Several Western states, including CA, NV, UT, AZ, and CO, allow riding on the shoulders of rural interstate highways. Don't see anywhere in the thread that anyone referred the 370 bridge to an interstate other than you? I would think twice about patronizing this establishment. They have been extremely unkind to their teenaged employees and downright hostile at times. It might be best to give your business to other local businesses that treat their employees with respect and dignity. I don't often leave comments online, but I was surprised at the first review on this site. My little sister worked with Riverside Sweets for two years and loved her job there. They treated her great, she enjoyed the atmosphere and the work. In the summer it's always hectic, and their treats are in high demand, but it's a quality place and from my family's experience, the owners don't deserve the comment above. They are still pretty close to my sister, and when she comes home on holidays from college they always invite her to come down and help them out; nice extra money for a student. If they don't deserve the bad press, then why comment on a thread that died 4 years ago? By doing so, you've brought a dead horse to the top of the list for us all to see. Sending my husband right now to pick up a box of fresh homemade fudge for a friends Birthday! :) LOVE IT!! This is one of the nicest places to visit for a snack when down of Main St. My father treats us to ice cream after the July 4th parade. There are about 30 of us and they are so friendly and helpful!!!! We love this park! We have been going there for years. The owners are wonderful people and so helpful. Very clean. Nice big sites. The "old street in St Charles" is wonderful. So many good resturants and so much history. I love that when we pull our rig into this park We know everyting will be top notch! Be nice if they would set aside a couple square feet for tent campers that are riding the trail.